I am a strong supporter of the no kill policy for wildlife. Helping to keep an overwhelmed population low by hunting, is another story in itself. I understand the need for that; in the long run, it helps the population thrive healthier, such as deer. Killing an animal for being in their natural habitat, or as shown by last summer after our fires destroyed their habitats, coming into the city for safety and food, is WRONG to me. I am pretty proud to say that El Paso County, Colorado has a sedate and release policy here. Of course, when an animal loses their fear of humans, other methods have to be taken. Responsibly, we can prevent that! I often search for news about our wildlife in the US, and came across this article, John Harrigan: Why hate the coyote but worship the wolf?. I agree with everything Mr. Harrigan said in his post. I am sharing with you the bit that he wrote that prompted this post. Go over and read the article too! This fosters the question: Why do we worship the wolf, with its soulful howl, as a symbol of conservation and everything we supposedly love about the wild, but on the other hand regard the coyote, “The Trickster,” the wolf’s close cousin, as nothing more than a rat at the dump? — John Harrigan in his article Why hate the coyote but worship the wolf? Coyotes need somewhere to go, especially when humans invade their homes. A person who can’t understand why a coyote is in a wooded area in the first place baffles me. That goes with the thought about any “predatory animal” in the woods where humans have decided to live. Sure, it’s always sad to see how the “food chain” works, but it’s reality of life. When humans introduce domesticated animals into the picture, while sad, it is inevitable. Does that make the coyote evil? Course not! The coyote is doing what is natural to them; same with wolves, mountain lions, etc. I am a firm believer in preserving our wild life; that makes us as humans (the “smarter” breed of animal, if you will….) have to be more diligent when living in their homes, and responsible for the children and domesticated animals we bring with us. With the fires over the last two years in Colorado destroying their homeland, we have to be even more diligent with wildlife coming into town. It’s called being RESPONSIBLE. We look at ourselves as the “Intelligent species”, we should be the ones to keep everyone safe. Seeing a coyote running down the street here is pretty common place, especially in the spring when they have babies to feed. I am never shocked anymore to hear that someone’s pet got attacked by X animal here. If you live in a wooded area and you see a predator animal attacking a deer… leave it be. Just like you, they need to eat too. It’s the nature of the beast. You don’t see anyone jumping in to defend your steak as you stick your fork into it when you try to eat it. Most people do not even give a second thought about the humane treatment of the animals that will be food on our tables. DO NOT leave them a food source. When we feed wild animals, we take away their fear of humans. They begin to test what is prey and what they should leave alone. I am going to say it, and I am sure there will be some upset people but… SPAY AND NEUTER YOUR ANIMALS! One of the biggest food sources we leave out for the animals is all the feral and homeless cats and dogs that live in the streets. Don’t let your pets roam the streets doing their business with all the other homeless pets in the neighborhood. Control the animal population by being RESPONSIBLE, then you have a less of an on demand food supply in your neighborhood. If you are a pet owner, and you know you have coyotes or other wildlife roaming your area, get a fence that is at least 6 ft tall with a roll bar on it. This will also stop your dog from jumping your fence. See video here. I would like to also add that you should keep an eye on your pets and children when they are outside. That’s common sense. Teach your children to NOT run up to an animal of any kind (including dogs) that they do not know. Safety first, always! You should, and your children practice this with any animal. 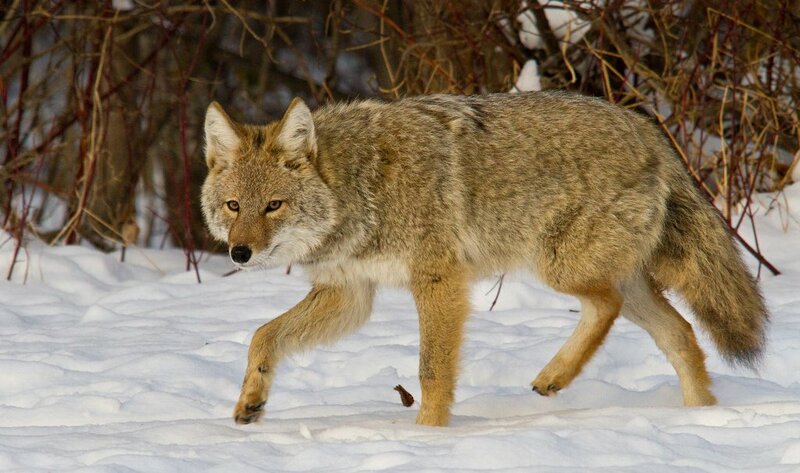 If approached by a dog or other wildlife such as a coyote, do not run or turn your back on the animal. This brings out the predator in any animal, including domesticated dogs. You kick start their prey drives. You should throw something at the animal, yell at it, USE YOUR AIR HORN we talked about above, wave your arms… be large and in charge; but don’t try to pet it. Once the animal has retreated, you BACK AWAY SLOWLY. With knowledge, we can live safely together. In closing, I also do not understand why coyotes are viewed as rats at a dump by most, and wolves are more revered. Being Native American, and a coyote spirit, I see brother coyote for the animal that he is. They are one of the most intelligent, adaptable animals known to man; in lore, a coyote bore the seeds of life. I respect the coyote, and now that you are informed, you should too. For more information on how to deal with coyotes in your area, please see the Living with Coyotes article at the Colorado Parks and Wildlife website. Do you see the coyote as a rat at a dump, or do you see them as more then that? Share your thoughts below. Great article. I agree we humans need to be more observant and respectful of animals. I don’t see why they call them that either. Great tip about the air horn!